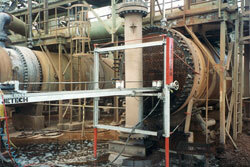 High pressure water jets can clean heat exchanger thoroughly and efficiently. Deposits and other particles can get lodged in the heat exchanger tubing, reducing the efficiency of heat transfer. Any reduction can result in higher expenditures for the operator. Use JETECH water jetting equipment to keep your heat exchanger running at its full efficiency. Typically, a high-pressure water jet heat exchanger cleaning system involves a small nozzle placed on the end of either a rigid tube or a flexible hose. The high-pressure water jet removes scale, rust, residue, and other deposits. The waste is washed away with the water.